When I’m feeling sick (like today) all I want is something to warm me up inside-out. 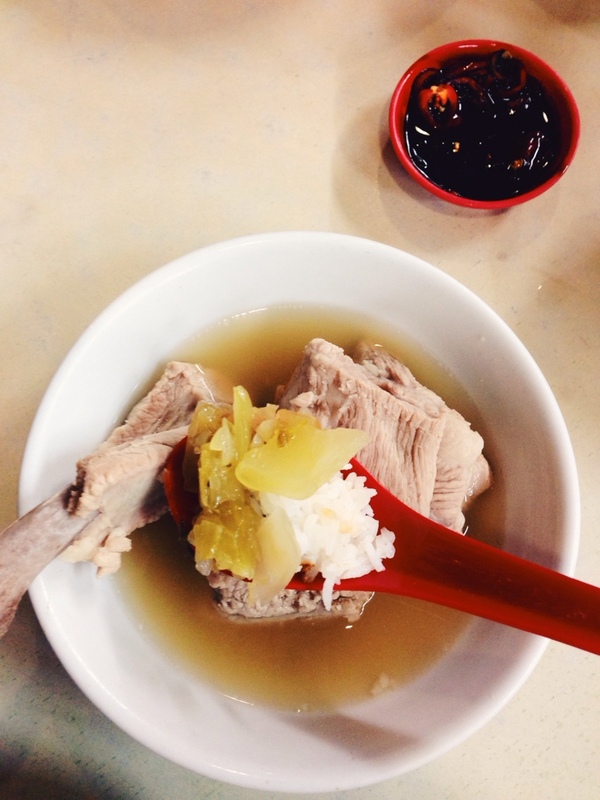 The spicy warmth of pepper always does that for me, making bak kut teh one of my favourite ‘sick person’ foods. Fatty pork ribs in a peppery herb soup, dipped in sweet black sauce, with salty vegetables on the side… Even when my nose is behaving like a broken tap and my throat feels like sandpaper, I can still taste it ;) I get my appetite back too, even if it’s just for a while! Do you ever feel like there’re too many thoughts swirling around in your head, and you just can’t get them to stop? I’ve been feeling that way, which makes it hard to settle down, relax and just enjoy the moment. Why can’t we just tell our thoughts to stop running around in so many directions? Sometimes it feels like trying to find your way out of a maze, but it’s so twisty, you keep getting lost. When I just can’t find my way out of the maze, I like to cook or do yoga. 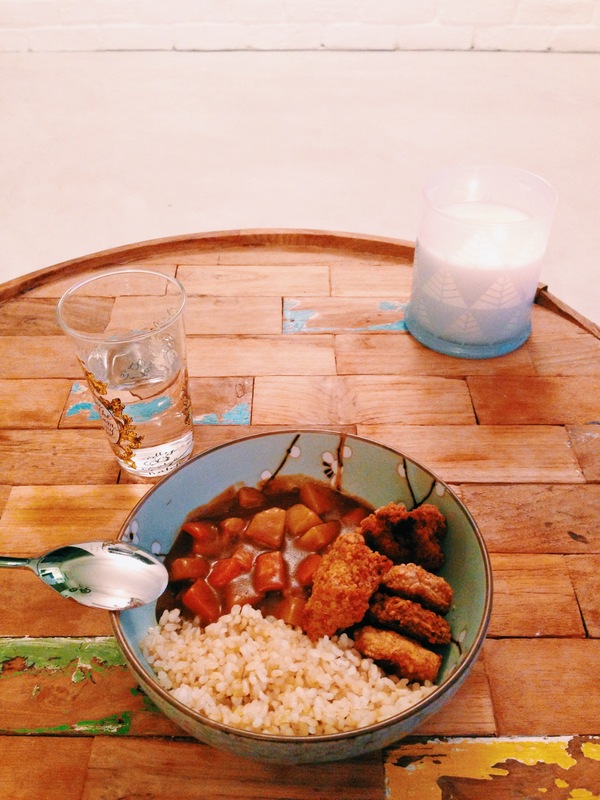 I was too lazy to yoga today, so I ended up making one of my favourite comfort food dishes instead – Japanese curry! Yes – this is all I use. Comfort food should be easy to make too, otherwise it would be too much trouble! 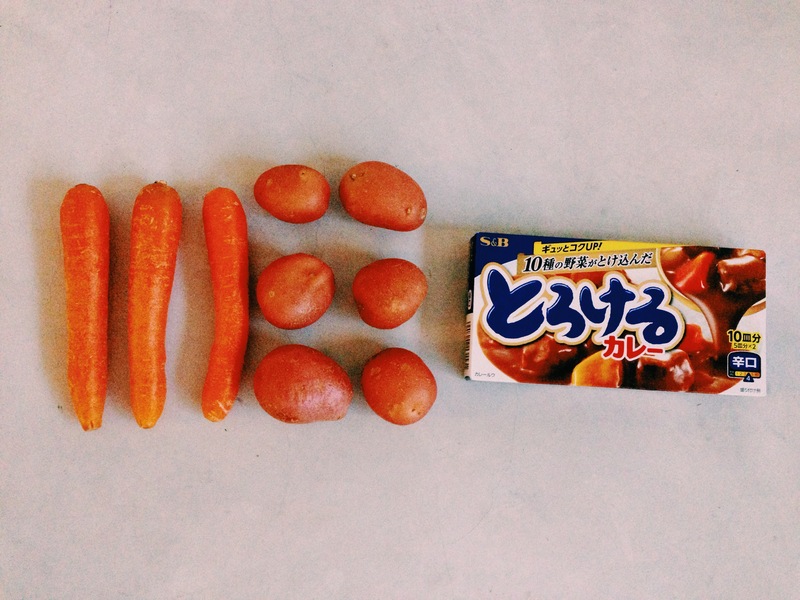 Chop the carrots and potatoes into bite-sized chunks. Fry in about a tablespoon of oil till lightly browned, then add water until it just covers the top of the vegetables. Add in the Japanese curry paste, stir it dissolves in the water, and bring the curry to a boil. Turn down the heat to medium, and let it simmer for about 15min, or until the curry is as thick as you like. TIP: The curry tastes great with short grain brown rice. It’s healthier too! 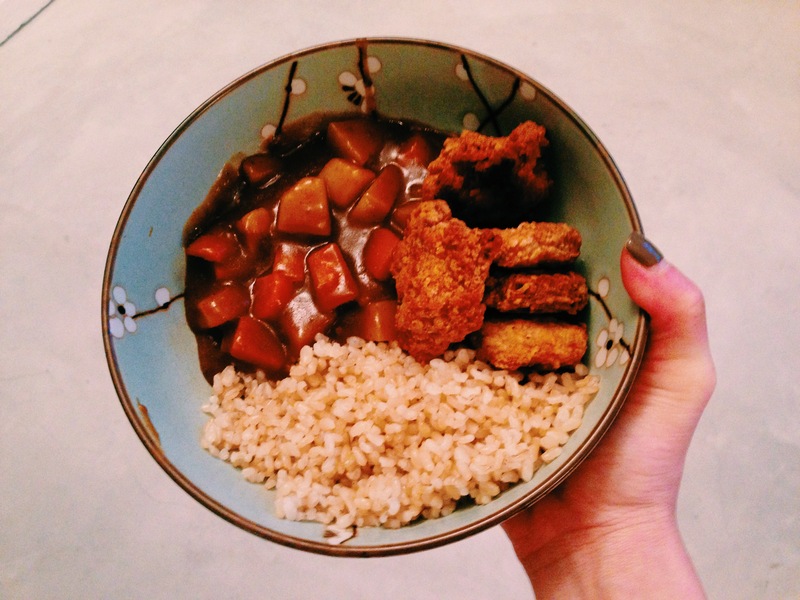 If you have more time to spend, try making katsu to go along with the curry. I only do that occasionally because my Japanese curry craving can hit me out of the blue, and I’m not always prepared to make katsu. My ‘shortcut’ version is to pop some frozen chicken or crab cakes into a toaster oven for twenty minutes, usually the time it takes for me to make the curry. I think cooking to settle my mind is great because at the end of it, I get to enjoy something yummy too :) Now I’ve really got to do some yoga! It’s been over a week since my last post, and I’ve only got one excuse – a new job has taken over my life. Crazy days and sleepless nights – that’s how it has been since February started. Someone said this to me today, and I think that’s the best comparison I’ve heard so far, especially since I’m definitely in the ‘wearing it in’ phase! When you’re going through a ‘wearing’ time, it always helps to have something to look forward to. For some people it’s an ice-cold beer at the end of the day, for others it’s going to the gym. For the past week, I’ve been craving chocolate. Dark, 60% – 70% chocolate that isn’t too sweet or bitter. The kind that melts on your tongue, and leaves you craving for more. Not just chocolate, but chocolate cookies too – and I’m not talking about the kind you can buy from supermarkets. Aside from Famous Amos Cookies that have such a distinctive taste, I haven’t bought any chocolate chip cookies that really hit the spot. Sometimes, you’ve just got to make them yourself. Whenever I need a chocolate fix, I turn to one of these chocolate recipes. These are just my current favourites – I love trying new recipes, so I’m sure I’ll find more to add to this list soon. If you’ve got some favourites too, please share in the comments below! One thing all the recipes have in common – they only taste as good as the chocolate you use, so go ahead and use your favourite brand. This recipe is adapted from Hamlyn All Colour Cook Book, a very old, very retro recipe book that I got from my mum. The recipe is for Polka Dot Dandies, but I usually skip the icing, replace the coffee essence with vanilla essence, and use this recipe for chocolate chip cupcakes instead. It’s a simple, no frills recipe that really hits the spot. TIP: For a ‘healthier’ version, replace half the self-raising flour with wholemeal flour, and add a bit of baking powder to help it rise a bit more. Preheat the oven to 175 °C (350 F). Use an electric mixer to cream the butter and sugar until it’s light and fluffy. It usually turns a pale, cream colour at this point. Beat the eggs, add in the vanilla essence, and add it slowly to the mixture. Make sure to mix in the eggs well each time, as adding them in too fast can cause the mixture to curdle. TIP: If your mixture does curdle, don’t worry! Folding in the flour after that usually fixes it. Fold in the flour using a metal spoon, and add in the chocolate chips. Spoon the mixture into paper cases lightly dusted with flour. Bake for 20 minutes, or until the cupcakes turn golden brown. If you’ve added wholemeal flour, they will usually look darker. Linda Lomelino’s blog Call Me Cupcake is one my favourite places to visit whenever I want to try something new. 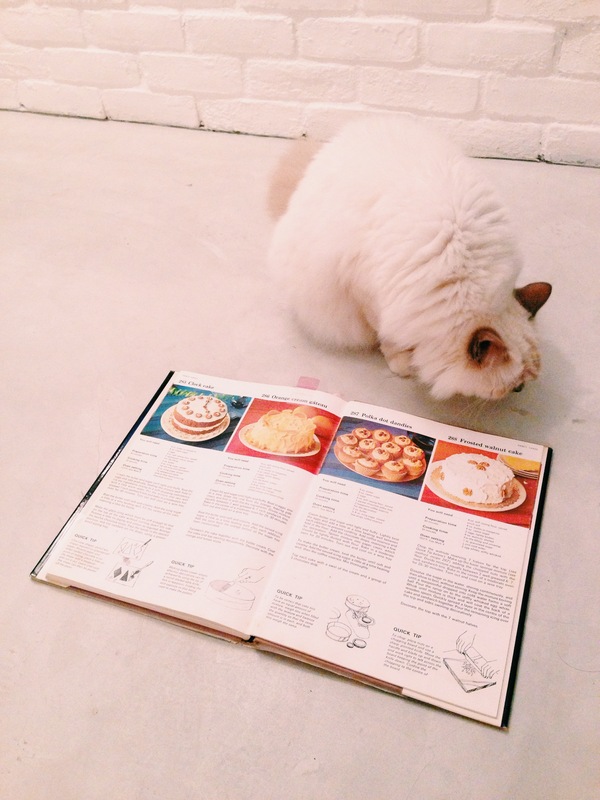 Her photos are beautiful, the recipes are easy, and they all sound so delicious! After lusting over these cookies for weeks, I finally spent some time making the dulce de leche the week before, and got down to making the cookies on Sunday. Making the dulce de leche was rather troublesome, but the cookies were worth it. TIP: If you’re using the microwave, keep an eye on it! I ended up putting it in for 1.5 minute intervals instead, after the mix boiled over once and made a sticky mess. It took a while longer, but at least I only cleaned up one mess. They’re an addictive blend of sweet, salty and chocolatey – A had one bite, and couldn’t stop snacking on them. It’s been non-stop madness since Monday, but that’s Chinese New Year for you! Lots to prepare, people to see, plenty of food to eat – it feels good being with people I love, but we all still need a quiet moment to just – be. Muddle the limes, brown sugar, and mint leaves together in a cocktail shaker. Add 90ml of brown rum and stir with a bar spoon. Split into two old-fashioned glasses, top up with crushed ice and a splash of soda. TIP: Be gentle when you muddle, and remove all the lime seeds first. 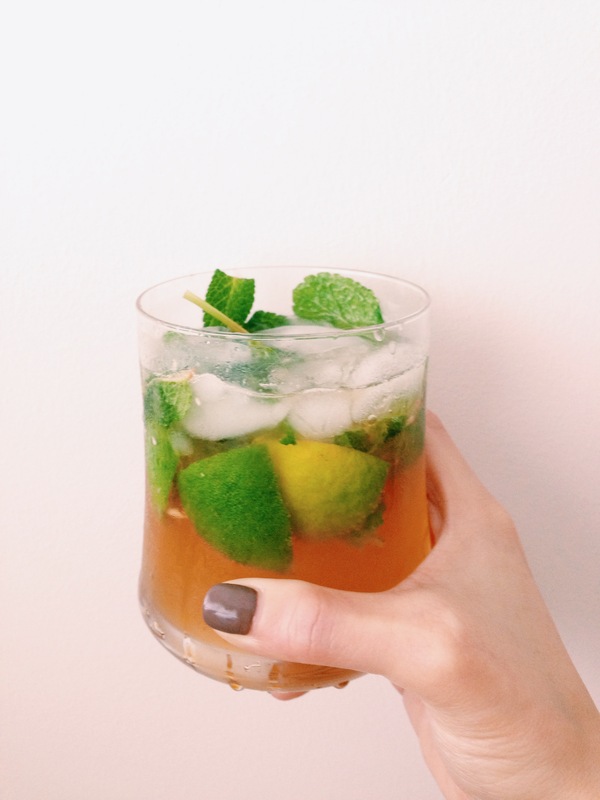 You want the limes and mint leaves squashed, not smashed. The weeks leading up to Chinese New Year can actually make me feel like I’ve had enough of the decorations, before CNY actually begins! 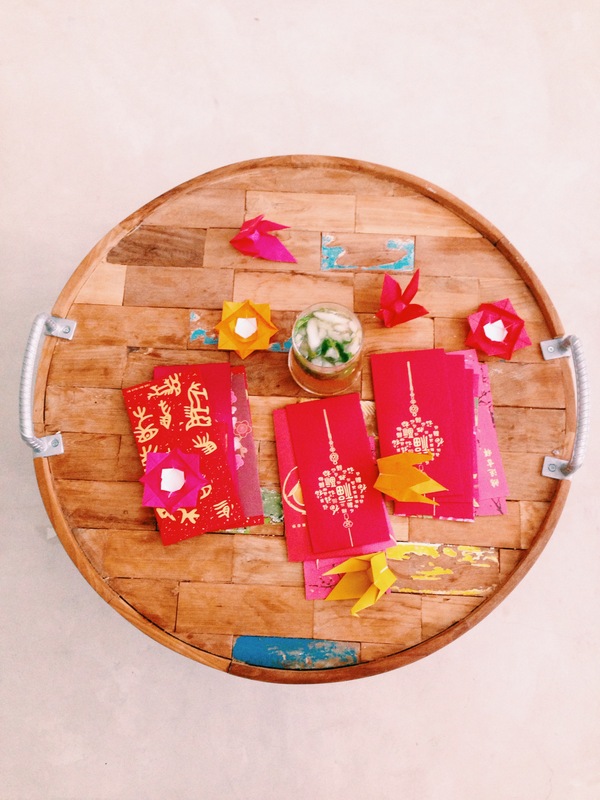 Still, it won’t feel like CNY at home without some colour – even if it’s not traditional-style ;) I love doing origami – partly because origami paper is always so pretty, and because I like the smell of the ink on paper. 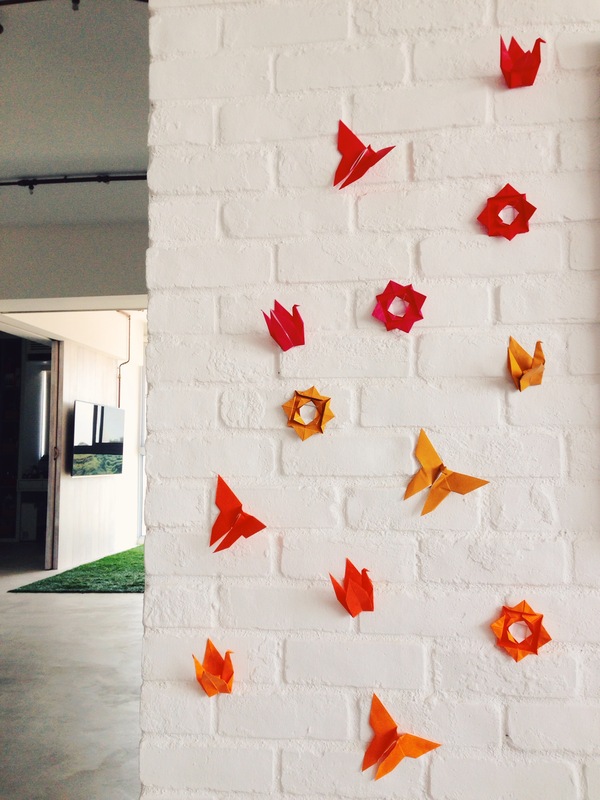 We covered part of the TV wall with origami flowers, butterflies and cranes – three of my favourite designs. I did think of using patterned paper, but I didn’t have any in colours I wanted. We ended up putting them up in a gradient – from light orange to red. I did the origami from memory, but you can find really easy to follow origami instructions here – my go-to resource when I feel like making something new.